Product code: W1390cc Categories: Rolex Watches, Watches. Here is a fantastic looking vintage Rolex Turn-o-graph “Thunderbird” reference 1625 from 1960 that has all the charm and characteristics of a vintage Rolex and is has such a great combination of sports Rolex meets dress Rolex. The Rolex Turn-o-graph was first made in 1953, and after a few design modifications, it was given this dress meets sports look so as not to compete with the emergence of the Rolex Submariner during this same decade. Also known as the Rolex “Thunderbird”, this name was given when worn by one “Thunderbird” pilot from the USAF Air Demonstration Squadron, the US Air Forces newly formed acrobatic squadron, it was then taken up by all other pilots and the name “Thunderbird” stayed for the Rolex Turn-o-graph. Made in a stainless steel Rolex Oyster case which measures 36mm across plus the Rolex screw down crown, it is fitted with the 18ct yellow gold rotating bezel which adds to the dimensions and gives it an even larger presence on the wrist.The combination of this large rotating bezel with the typical champagne coloured dial with elegant index markers, really showcases its cross over look and style as a watch that can be worn to nearly any occasion or situation imaginable. Inside it is powered by the 25 jewelled automatic Rolex calibre 1560 that is fitted with the gorgeous butterfly rotor and comes with our twelve month warranty. For a vintage Rolex watch that combines sport and pleasure, then this Rolex Turn-o-graph “Thunderbird” might just be the one. Tags: Rolex, Rolex Thunderbird, Rolex Turnograph. Vintage Rolex Turn-o-graph “Thunderbird” reference 1625 from 1960. 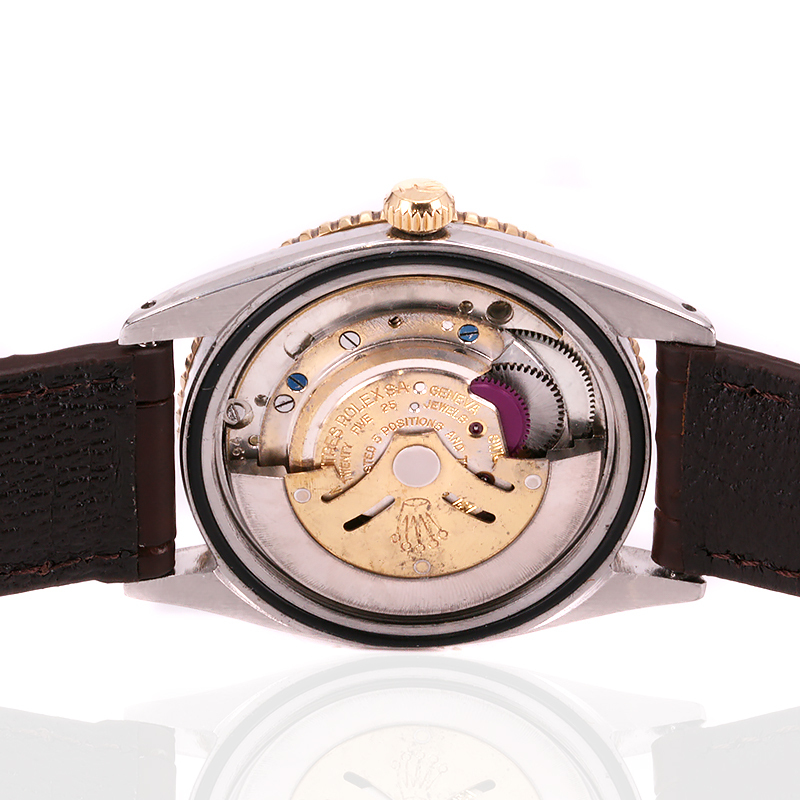 The Rolex Turn-o-graph was one of the first watches by Rolex to have a rotating bezel. With a combination in look of sports as well as dress, the Rolex Turnograph is a “go anywhere” watch. Keeping in mind not to compete against itself with the Rolex Submariner, Rolex changed the style and design in the late 1950’s to give it this more crossover style and design. Indeed advertising from the era said, the bezel was “a reminder of times past, for phone calls, conferences, timing, parking and countless other ways“.